I'm giving you all some secrets, says Kellie Shanygne Williams, who plays Laura Winslow on ABC's "Family Matters." OK, you can trust us. We won't tell. "I know what the last, final episode is about." Cool. Why don't you whisper it? What?!! Steve Urkel's marrying Laura Winslow?!? Wait, slow down. Kellie says that Urkel, played by Jaleel White on ABC's long-running Friday night comedy, will step into that machine that turns him into super-cool Stefan Urquelle. And Stefan and Laura may wind up getting married on the last show of the season, which will air in a few months. 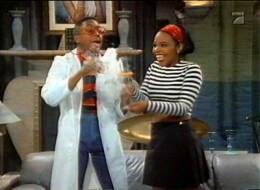 But is it possible that Stefan will turn back into Urkel, maybe at the altar? "I'm not sure," says Kellie, 19. If that does happen, it will add another chapter to a show that's been around six years. Marriage or not, you wonder if Kellie would be willing to hang for another year. "We've been on the air for a while, and I mean, it's fun and we have so much fun together," says Kellie, who's been acting for 14 years. "So however long it goes, we're kind of sticking in there and producing the shows as long as we can run it." Part of the fun of "Family Matters" for Kellie is the way the show is set up. Serious messages are woven into some episodes along with the laughter. "Fortunately, I get to do a lot of the dramatic roles on our show, because the producers write drama in our show a lot," she says. Drama comes easy for Kellie. When she was little, Kellie did a lot of dramatic theater in Washington, D.C., where she was born. 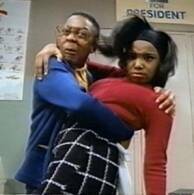 "Family Matters" was her first stab at comedy. An example of the type of drama Kellie's show can get into happened weeks ago. Laura wondered if she needed a gun to protect herself against a gang of girls who took her leather jacket at school. A friend of Laura's who did have a gun was shot because someone wanted to take her gym shoes. "Our show is mainly watched by young kids," Kellie says. "And so we've never dealt with a subject this harsh." Kellie and Jaleel came out of character at the end of the show to tell kids to try to squash the violence. But why do such a heavy show? Kellie says: "I guess (the producers) felt responsible for shedding light on some of the things that are happening in the young environment today." Kellie's got more things on her mind than "Family Matters" - like college. She'll be going to the University of Southern California in the fall. "I actually have some friends that go there already, so I hang out there a lot," she says. "I'm looking forward to going there like a regular student." Kellie isn't giving up "Family Matters." But can she handle both a weekly TV show and a college schedule? "I hope so. Well, Jaleel's going to UCLA, and he's managing. So I think I can manage."